There is a tradition in Orihuela which dates back centuries, regarding the bishop, a glass of lemonade, the Puerta de la Olma and a white mule. It all sounds the perfect ingredients for a bad joke, but this is for real and dates back to the founding of the Bishopric of Orihuela in 1564. 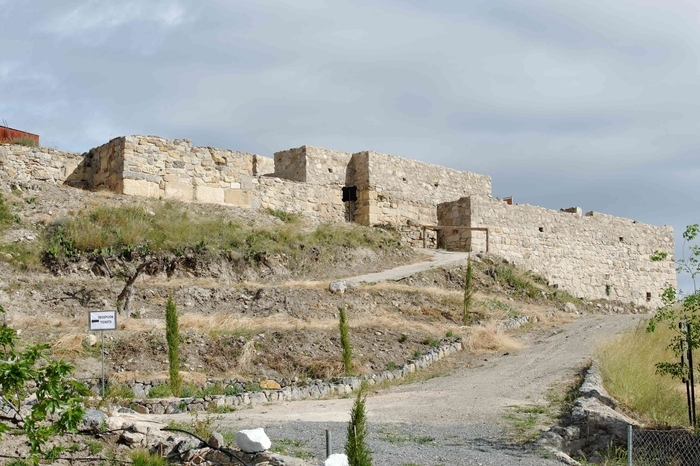 The Bishopric of this area has had a long and convoluted history, its first seat in the Visigoth city of Begastri in Cehegín, across the border in Murcia, during the era when Christian Visigoths occupied Spain. This was a turbulent period: the Roman Empire had split into two during the fourth century AD, and waves of Germanic tribes had occupied Spain. Following this, the Eastern Roman Empire, known in our culture as the Byzantians, had attempted to retake Spain, succeeding briefly for around 50 years, before once again being evicted by the Visigoths, who held power until the Moors invaded at the beginning of the 8th century. Christianity had begun during the Roman occupation, and was also practiced by the Visigoths, who established the see of the Bishopric in Cehegín, before transferring it to Cartagena following the defeat of the Byzantines. In 1243 the Christian Reconquist reached this area of Spain and both modern day Murcia and Orihuela fell to the forces of prince Alfonso of Castile, later to become King Alfonso X, El Sabio, of Castile y León who transferred the bishopric of Cartagena to Murcia. 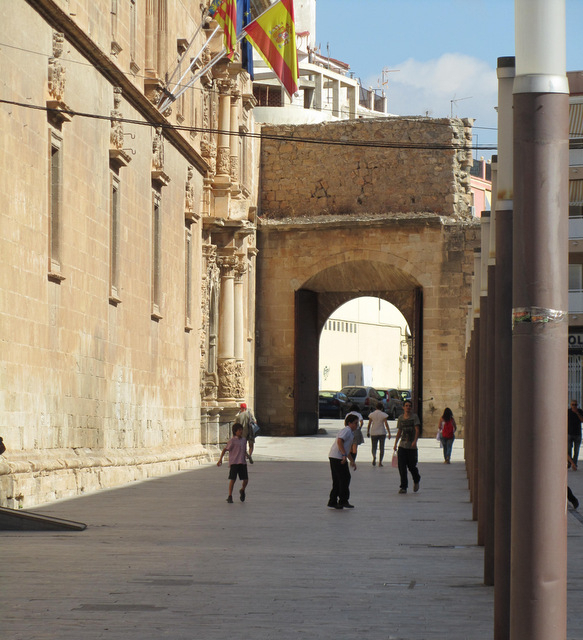 In 1304 the house of Castile lost Orihuela to Martin of Aragón, who petitioned the pope to give it a bishop of its own, leaving the Bishopric of Cartagena in Murcia. Finally, in 1564 an independent bishopric was granted for Orihuela and in 1566, the first Bishop, Gregorio Gallo de Andrade took office. Since then, the main see of the bishopric has transferred to Alicante, although the Cathedral of El Salvador in Orihuela, remains the main cathedral within the bishopric, which covers an area of 4,415 square kilometres and cares for the spiritual wellbeing of the 1.15 million Catholics who live within the Diocese of Orihuela-Alicante. 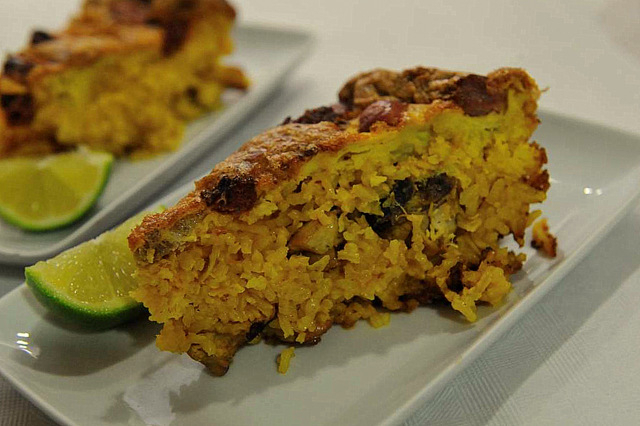 Before officially taking up his position, every new Bishop of Orihuela enjoys a lunch of “arroz y costra”( click Arroz y costra) a traditional rice and meat dish which is still served in the restaurants and homes of the diocese, eaten in the nearby town of Cox. He then travels to the area of Orihuela known as San Antón, which lies next to the Palmeral, via the towns of Callosa and Redován. Once in the San Antón area of Orihuela, he stops to pray at the hermitage there and drinks a glass of cold lemonade, as every new bishop has done since Gregorio Gallo de Andrade in 1566. 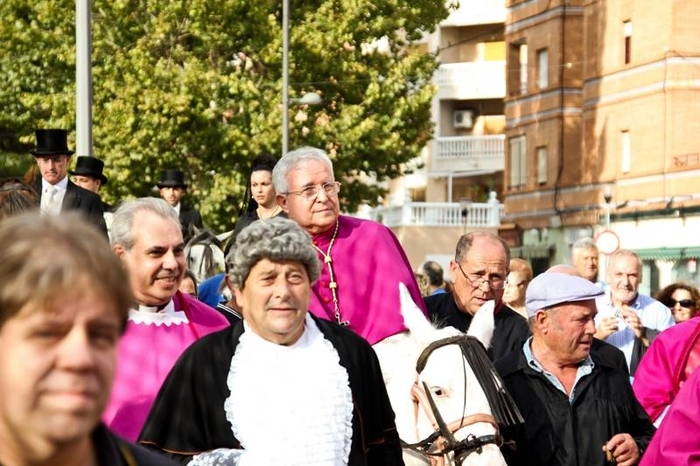 Suitably refreshed, the soon-to-be Bishop then climbs onto the back of a white mule to continue his journey to the Puerta de la Olma, next to the Colegio Santo Domingo, the most important religious establishment in the city, accompanied by local dignitaries on horseback. In order to complete the ceremony the gate itself is always closed to the bishop: the verger has to knock on the door, at which point the Mayor formerly asks who is seeking to enter the city walls, and upon receiving a formal request from the new bishop, opens the gates and allows the new Bishop into the city. He then continues on foot to the cathedral, La Catedral de El Salvador y Santa María where he officially takes charge of his post. The last time this occurred was during 2012 when the current Bishop, Bishop Jesús Murgai Soriano took charge of the Bishopric. Some have seen in this ceremony an allegorical similarity to the arrival of the Messiah in Jerusalem, where he was greeted by cheers and acclaimed as the Son of God, probably reflecting the rapturous enthusiasm with which the first bishops of Orihuela were received after a struggle lasting centuries to be granted independence from the bishopric of Cartagena. Such traditions of public arrival for bishops are maintained in Spain only in Sigüenza (in the province of Guadalajara) and Orihuela.